We would like everyone to benefit from our services. Please feel free to print out the coupons below and bring it with you. If you are already our client and would like to recommend our services to a friend, please feel free to pass along the coupons. 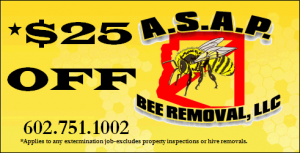 Currently we’re running the $25 discount that is applicable to any extermination job, excluding property inspection or hive removals.